Harare — The beleaguered Zimbabwean government has threatened to expel some diplomatic missions and foreign sponsored non-governmental organisations (NGOs) for allegedly influencing regime change in the country. 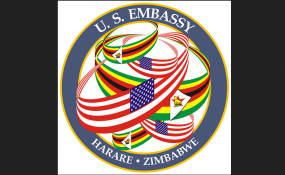 The United States (US) and Germany are mainly targeted for reportedly masterminding a wave of strikes by civil servants, which saw burning of tyres in the country's cities of Harare, Bulawayo, Chitungwiza and Kadoma. President Emmerson Mnangagwa's government is also accusing the Western nations of sponsoring the NGOs and opposition Movement for Democratic Change (MDC) Alliance to force the removal of government. The warning comes at a time civil societies, workers unions and MDC-Alliance embarked in a shutdown protest over the worsening economic situation. The mass protests which were initially set for January 23-26 caught the government unaware as protesters started demonstrations on Monday leading to Wednesday morning (today). The ruling Zimbabwe African National Union-Patriotic Front (ZANU-PF) has for years blamed sanctions imposed by the West for the economic woes. "Government is aware of the involvement of non-citizens in the orchestration of this futile exercise (street protests),"said Secretary for Information, Media and Broadcasting Services, Nick Mangwana. He warned, "Government will not hesitate to take action against such persons by withdrawing their visas, deporting them and declaring them persona non grata." Mangwana warned locals from conspiring with NGOs and foreign forces to subvert peace, law and order in the country. He claimed state security had been closely monitoring secretive meetings between some diplomats assigned to Zimbabwe and civil society organisations. The meetings, he said, were aimed at toppling Mnangagwa. "These unlawful meetings and treasonable liaisons with foreign organisations must stop forthwith." There were no immediate response from the US and Germany embassies in Harare at the time of going to press but the threats by government are contrary to Zimbabwe's mission to mend relations with the West. Zimbabwe is battling acute shortages of fuel, basic commodities and drugs owing to a severe scarcity of foreign currency.